I am hosting a blog challenge in September 2013. 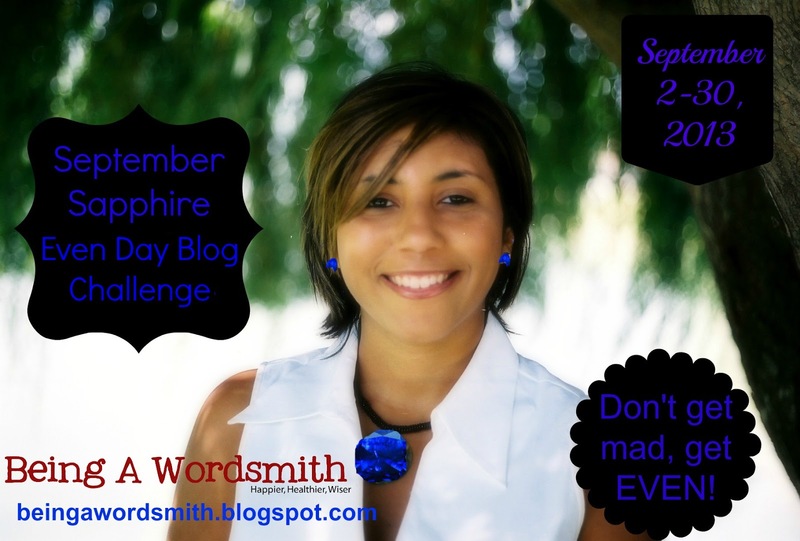 It is aptly named September Sapphire Even Day Blog Challenge. September is my birthday month. Sapphire is the birthstone. Like how I blinged out my pic above? Gotta love PicMonkey. I really enjoy connecting with new bloggers and I get to celebrate my birthday all month with all of you. The challenge begins on Monday, September 2, 2013 and ends onMonday, September 30, 2013. Sunday, September 8, 2013: Guffaw. Talk about 2 blogs you read that always force a belly laugh out of you. Why? Monday, September 16, 2013: Dramatization. What part of your life closely resembles a storyline in a reality TV show or soap opera? Tuesday, September 24, 2013: Monetization. I partner my blog with affiliate programs and sponsored posts. Do you? If so, how and with whom? If not, discuss how you reach readers. Saturday, September 28, 2013: Pinaholic. (Okay that’s not in the dictionary currently, but give it some time.) Share your Pinterest URL and show off some of your favorite boards and pins. Not a problem at all, Amy. I appreciate any participation you can give. Sounds great, girl! I'm participating in 3 other challenges, so I totally understand. I appreciate it. Happy to have you link up! Hum, not sure where my comment went…can you check your spam. Anywho, you know I'm in! Will do my best to do most! Girl, I am so ready for some serious blog makeover maintenance. You are “whitelisted” on my Intense Debate page, so you shouldn't be spammed. Yet sometimes my commenting system switches back to the Blogger template and “eats” my Intense Debate comments. Sorry about that girl. I appreciate the love. I'll be all up in your challenge on Sept. 16th. Something else we have in common! Looking forward to your posts, Kennie. My recent post Will They Miss You When You're Gone? Count me in! What do we need to do to join? Just link up your post for the prompts above on the applicable days. There will be a link-up on my post for each day of the challenge. Thanks for the support! Fabulous! We're going to have a great time. Sounds fun. . . and I love prizes! 🙂 I hope to join all of you in September. I hope so too! I enjoy meeting and connecting with different bloggers. Thank you. I am always up for a blog challenge. I love the new traffic it brings! Thank you starting the challenge! My recent post What Would You Do? Glad to have you join, Lisa. Thank you. This is a good idea! Looks like tons of fun! Question is, can I actually do it?! Any way you can participate is fine with me. Hope to see you there, Kristen. I am just getting back to blogging after taking a little summer break. This sounds like a fun task. We will see if I can keep up. If not, I will happily follow along with those that are meeting the challenge! I appreciate the support, Karen. I think it'll be a lot of fun! Sounds good, Kimberly! I'll give it my very best shot. Happy to hear it, Alison. I'll definitely link up when my brain works for the topics! Look forward to seeing!! I appreciate that, Kate. I'm excited about doing it. I'd love to join in the fun! I'll be watching for it! My recent post Manage your Customer Relationships and Projects with Insightly! I just got settled into my new home in Michigan, and I'm about to get back to work on my blog again! This looks like a perfect place for inspiration! Can't wait to see the prompts and participate if I am able! Glad you have settled in, Mandi. Not sure which part of Michigan you are in, but I still keep in touch with a good number of people in Rochester Hills, Ann Arbor, Mt. Clemens, and other areas near those. Would be happy to connect you with a few people. Hope you can participate in the challenge. I think it would be great for blogging again.